Hey everyone, OPBlocks V4 is finally ready to release! After nearly a month and a half of development, I'm glad to announce that we will be open tomorrow (4/26/2017) at 3 PM EST! Candy effects have been drastically nerfed to help balance PvP. You can no longer obtain candy from mines, which will make it more rare. Daily rewards have been drastically improved. The economy has been tweaked to make it slightly easier to rank up. As some of you may already know, @trkey has hired me to be the new manager of OPBlocks, and help him with the creation of OPBlocks 4.0! So I thought the best way for me to get started, is to hear what the community wants to see in the next reset. I will try to respond to every suggestion, but give me time. Edit: Lovakite ran into real life problems and is no longer able to run OPBlocks. This post has been edited to reflect the new manager. First off, I’d like to apologize for the lack of communication recently. I didn’t really know what I was going to do until recently and was scared to show you guys uncertainty. That was a bad decision, I should have kept you guys updated. I’ll improve. As you may have seen, Tuxx, Luck, and Coolkish aren’t working on OPBlocks anymore. We’ve decided that it’d be best for them to work on another project of mine. With that, I’ve decided to bring on a friend who goes by “Amazing” to run OPBlocks. He’s an expert in Prison servers and will do a great job. Howdy OPBlockers, over the next few weeks we're going to focus on growing and improving our staff team. I'm making this post to encourage everyone to consider applying to be part of the OPBlocks staff team. If you meet the mandatory requirements and post an application of a good quality, we'd love to have you on the team! If you do decide to apply please read over this post for general guidance. To further increase the number of applicants we've made some changes to the mandatory requirements. Good luck to anyone that decides to apply! This is just a short announcement to notify you of the latest additions to our store - Gift Cards and Unbans. Unlike vouchers, Gift Cards can be used as many times as you like until the balance reaches zero. They do not expire so you can spend the balance whenever you please! Purchasing a Gift Card will send a code to your email so take caution and make sure to enter your real email address when checking out. As you can see, larger gift cards are heavily discounted. Buying a higher priced Gift Card is a great way to save money. For $80, you get $100 to spend on our store! That's an extra $20 saved on top of 65% Valentines Sale which entitles you to a free ❤ title with every purchase! The 65% off Valentines Sale has just began, every purchase will entitle you to a free ❤ title. Grab them while you can! We’re back with another weekly update introducing some highly requested features! We’ve spent the last week ensuring refineries are in a stable state so you should no longer loose items from refineries. We apologise for the issues surrounding Candy Refineries lately however we’re confident this is the last of them. At Spawn you’ll find our latest addition - Leaderboards. Show off your accolades to the server and gain bragging rights! 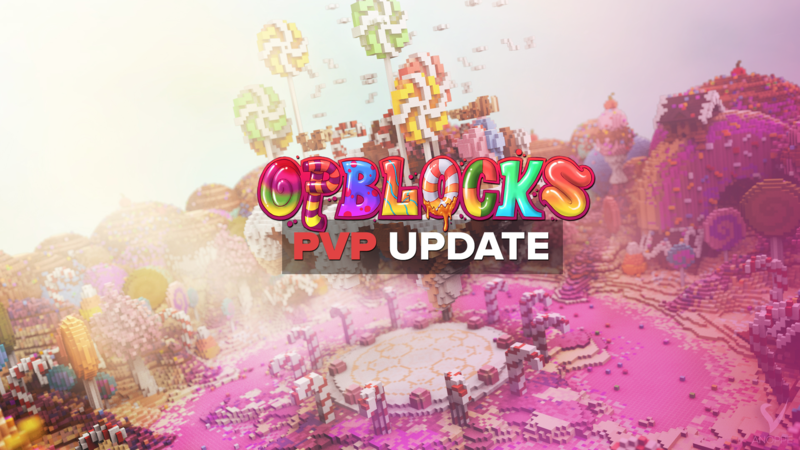 Hey y'all, as of yesterday myself and Coolkish have returned to the OPBlocks team to continue managing the server. It sure is great to be back and I look forward to bringing you some awesome updates very soon! The main reason for this post is to announce the highest voters of January and state the rewards you will be receiving. As a token of our appreciation, we'll be rewarding the Top 10 highest voters store vouchers. Please create a donation support thread here to receive your voucher. We'd like to thank everyone that voted this month and encourage you to keep voting throughout February to stand a chance at receiving a voucher! This is just a quick update post to inform everyone about what's happening with the ongoing issues with refinery / factory progress being lost, and the continued bugs with this system. I can only apologise that these issues have lasted for as long as they have done. We've poured hours of development time into looking into this problem, and are just as frustrated as you guys. I rolled out a patch for this issue just over an hour ago, and have spent some time with the staff team testing the new system - our results so far indicate that the issue is now resolved. I am unsure quite what the extent of the data loss is, however we know it has affected a number of users. To compensate for the lost progress, all players have had their EToken balance set to at least 3,000. (if you had more than this, your balance will remain the same). This should allow you to repurchase some of the lost refinery unlocks & factory boosts. Hey Candy Lovers, we've spent the past few weeks working on some PvP improvements. Under each realms spawn you will now find a delicious and awesome looking PvP arena! We hope to see some intense fights taking place as well as players making the most of their Tier 3 Candy. In addition to the PvP arenas, we've added Supply Crates! Protect the supply crate for long enough and stand a chance at receiving some awesome loot. We've also made some minor tweaks to the kits, improved chest shops and the trade feature has returned! As always we hope the V3 update is still keeping you entertained, hopefully this content update will provide further enjoyment. Howdy OPBlockers! Hopefully all of you had a wonderful Christmas and speaking on behalf of the OPBlocks team, Happy New Year! To kick 2017 off with some enjoyment we've released a brand new Bubblegum Realm! Here you can find some stunning new builds and you might even come across some awesome YouTubers to play with. As you've probably noticed we're constantly releasing new features and changes to not only improve the V3 release, but to make your OPBlocks experience as enjoyable and as smooth as possible. Finally I would like to mention the 65% Off Christmas sale will be ending tomorrow, make sure you don't miss out!